Symprove is a fresh, active product that is produced in small batches with a maximum shelf life of 3 months. Therefore, our stock can vary between 1 month and 3 months shelf life from the date of purchase. Please take this into consideration when buying in bulk quantities. Symprove is a multi-strain, non-dairy drink containing lactic acid bacteria to maintain digestive health and replenish `friendly` bacteria in the gut. The 4 species of naturally occurring bacteria are grown on an extract of germinated barley. The barley also contains a unique food source (prebiotic), providing the best possible conditions for the Symprove bacteria to thrive and work effectively in your gut. Symprove is also certified gluten free. Also available in: Original Flavour. Water, extract of germinated barley, live activated cultures of: L. rhamnosus, E. faecium, L. plantarum, L. acidophilus, vitamin C, acidity regulator, trisodium citrate, preservative: potassium sorbate, natural flavourings, sweetener: sucralose. Shake the bottle gently before use. Take one full cup (60ml) of Symprove every morning 10 minutes before you eat or drink. 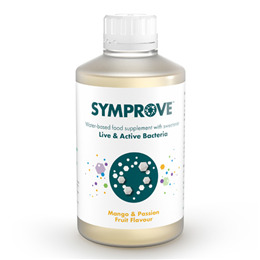 Below are reviews of Symprove Live & Activated Bacteria - Mango - 4 x 500ml by bodykind customers. If you have tried this product we'd love to hear what you think so please leave a review. I generally take it for a couple of months once a year - I take probiotic supplements for the rest of the year. It resets my stomach and I feel cleansed. For me, the mango tastes better than the original. I have been taking Symprove for many years and hopefully I will continue to take it for many more years. Have been using it for several years. Good if I feel a colitis relapse coming on. This is by far the best Probiotic ever! i was suffering from long-term stomach problems like acid reflux and bloating from years of taking antibiotics, after taking this miracle product, I haven't had any problems since using it!! Currently on week 7 and I can really notice a difference. My stomach feels brand new, and I haven't experienced any problems at all since using this product. Worth every penny! The product is worth trying if you have not managed to resolve alimentary discomfort. I intend to carry on taking it after 12 weeks maybe alter the frequency. Used Symprove periodically for about a year. Can only tolerate low dose unfortunately. Having tried the Mango flavour I find it tastes like sweet vanilla so will revert to Original next time. The product works well for me and the service from Bodykind is always efficient. Was skeptical at first, but went initially for the 12 week trial only paying for 8. Although it took a number of weeks it worked for me, and I have been using it for over a year now, albeit on an every other day regime. For me it works very well for constipation type IBS. Bodykind have always been helpful and their service is very good. Using symprove due to IBS type symptoms from acid reducing perscription drug. Excellent product no more problems. I started taking Symprove for three months before Christmas 2012. I was diagnosed as having Candida albicans. The Candida completely cleared up. I have since taken it for one month, twice a year since then. My overall wellbeing has improved so I will continue to take it as a top-up on a regular basis. I find the mango tastes better than the original flavour. Brilliant product best i have used. And i will keep using it as i can honestly say it changed my whole wellbeing went from a severely restricted diet to being able to eat what i want when i want . I have been using Symprove for several years now. It was recommended by a dietitian to manage symptoms of IBS due to a food intolerance. If I don't take Symprove because I am abroad then these symptoms start to come back. I have not found any other product that works as well. 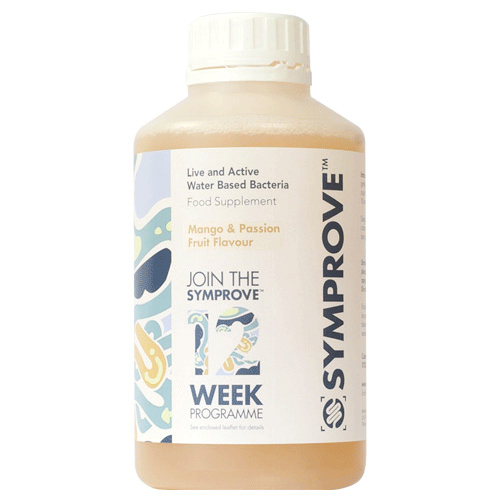 Symprove Live & Activated Bacteria - Mango & Passion Fruit 4 pack is a multi-strain, non-dairy drink containing lactic acid bacteria to maintain digestive health and replenish `friendly` bacteria in the gut.